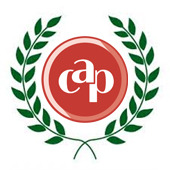 The CAP Award for Excellence in Teaching High School/CEGEP Physics, which was introduced in 2010, is intended to recognize excellence in teaching physics in Canadian high schools or CEGEPs and to encourage and promote physics at the high school/CEGEP level in Canada. The award has been sponsored at the national level by the CAP, TRIUMF, Perimeter Institute, the Institute of Particle Physics, and Nelson Education, and at the regional level by the Association of Professional Engineers and Geoscientists of BC. Visit http://cernhst2011.tumblr.com/ to see some thoughts from Peter Vogel from BC, the 2011 HS Award winner selected to participate in the 2011 CERN HS Teachers Workshop. The next awards will be awarded in the year 2019. 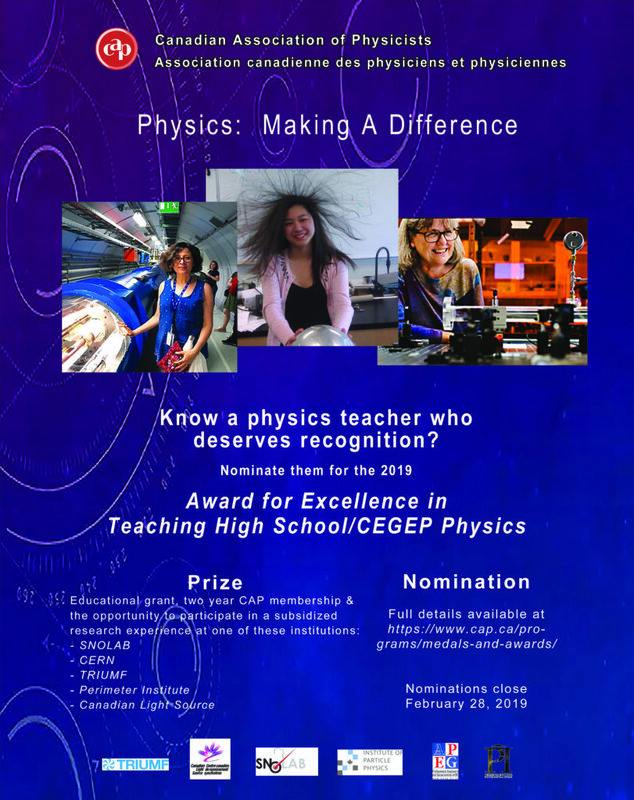 The awards honours physics teachers in Canadian high schools or CEGEPs who have a good understanding of their subject and who possess an exceptional ability to communicate their knowledge and understanding in such a way as to motivate their students to high academic achievement in physics. The nominee should have demonstrated the ability to develop innovative teaching methods and/or style and should mentor students in physics, through such activities as the CAP high school prize exam, other prize exams, special tutorials, etc., as well as mentor new physics teachers. Nominees should have a history of participation in extra-curricular physics-related activities such as the Science Fairs, physics contests, public outreach activities, and the CAP’s Art of Physics competition (class category). Evidence relating to the promotion of science, participation in non-physics extra-curricular activities (sports, drama, etc. ), and achievements relating to student performance will also be considered but are not weighted as high as the physics-related activities listed here. Awards are given annually in each of five regions in Canada: BC/Yukon, Prairies/NWT, Ontario, Quebec/Nunavut, and Atlantic Canada. The award includes two free years as a CAP member teacher and an educational grant that can be used to support professional development for the teacher or to purchase computer software, equipment or books for the classroom. Winning teachers will also have the opportunity to participate in a one-week training program at a Canadian research institution. Representatives of the CAP will present the recipients with two duplicate certificates (one to be displayed at their school and one for their personal use) at their school.